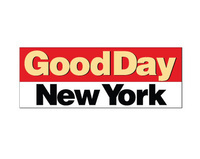 Good Day New York is a morning television newscast airing on WNYW (channel 5), a Fox owned-and-operated television station in New York City, New York that is owned by the Fox Television Stations subsidiary of 21st Century Fox. It was the first morning newscast to air on a Fox-owned station, having launched on August 1, 1988. The program broadcasts each weekday morning from 4:30 to 10 a.m. Eastern Time. The 4:30-7 a.m. portion is a general news/traffic/weather format; the 7-10 a.m. portion also features news, traffic and weather, but also incorporates entertainment segments (including celebrity interviews " both in-studio and occasionally via satellite) as well as feature segments (such as fashion and food segments). • Haylie Duff on Hilary Duff dating Jason Walsh -- "I think she's really happy"
• Hilary Duff on dating Jason Walsh: "We have a lot of fun"
This webpage uses material from the Wikipedia article "Good_Day_New_York" and is licensed under the GNU Free Documentation License. Reality TV World is not responsible for any errors or omissions the Wikipedia article may contain. Bethenny Frankel: Ramona Singer's remarks about Dennis Shields were "despicable"